At home my FTTH Internet connection is provided by XS4ALL. They provide a FRITZ!Box router to connect to the Internet. Instead of using the FRITZ!Box I’ve always used my own Debian GNU/Linux machine to route traffic to the internet. My XS4ALL uplink is connected to a managed switch. My Motorola 1963 TV Receiver is directly connected to an untagged VLAN4 port on my switch. This way the TV Receiver is directly connected to the TV platform on OSI Layer 2. Recently I got a letter from XS4ALL saying that this setup is going to change. The TV Receiver can not be connected to the TV platform directly anymore, but needs to be part of the internal network. This adds the ability to support Internet services (like Youtube, Netflix, etc.) on the TV Receiver. In my current setup the upstream connection is connected to a managed switch. 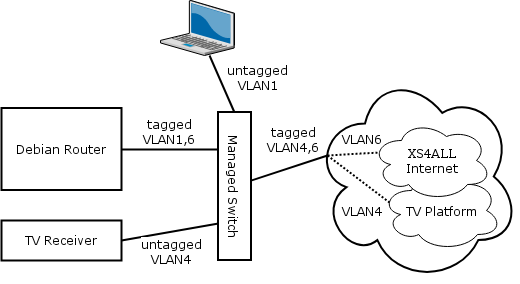 VLAN4 and VLAN6 are tagged on this switchport. The TV Receiver is connected to an untagged VLAN4 switchport. It can directly communicate with the TV platform. The Debian Router is connected to a tagged VLAN6 switchport for internet access and a tagged VLAN1 switchport for the local network. Devices on the local network connect to the Internet via the Debian Router on VLAN1. In the new setup the TV Receiver is not in untagged VLAN4 anymore. Instead VLAN4 is now tagged on the switchport of the Debian Router as it will function as a gateway to the TV Platform. I created VLAN104 in which the TV Receiver will be. It’s also possible to create a setup where the TV Receiver is in VLAN1, but my Managed Switch currently doesn’t support IGMP Snooping. The result of that would be that if you are watching TV, all other devices in VLAN1 also receive the IPTV multicast traffic. In a more detailed view, leaving out the physical hardware, it looks like the diagram below. Local devices on VLAN1 access the Internet through the Debian Router, which routes the traffic to VLAN6. The TV Receiver on VLAN104 accesses the TV Platfrom through the Debian router, which routes it to VLAN4. The Debian Router runs an igmpproxy to route Multicast Traffic (IPTV) from VLAN4 to VLAN104. The red arrow shows that the TV Receiver is now also able to access the Internet for for services like Youtube or Netflix. How is the Debian Router configured? This entry was posted in Know How, Linux and tagged debian, iptv, IPTV_RG, kpn, linux, xs4all on February 16, 2019 by pommi. I recently upgraded my DNS server to Debian Jessie. In fact I reinstalled it from scratch and used puppet to install and configure all the required components. This DNS server, running bind9, is the authoritative nameserver for nethuis.nl. nethuis.nl uses DNSSEC. To apply DNSSEC I used dnssec-tools, which gives you tools like zonesigner, rollerd and donuts to sign, roll and check your DNSSEC enabled zones. Two years ago I had a hard time setting this up, hitting various bugs in dnssec-tools 1.13-1 from Debian Wheezy. I ended up running a quite stable setup after packaging dnssec-tools 1.14 and using a patched version of zonesigner that didn’t increase the serial of the zone. undefined method Net::DNS::RR::new_from_hash at /usr/lib/x86_64-linux-gnu/perl5/5.20/Net/DNS/RR.pm line 791. This thread indicated there are more related issues in the dnssec-tools package. OpenDNSSEC looked like an alternative. I could have also used the tools that come with bind9 to sign, roll and check my zones. But I liked to try something new, PowerDNS. The nethuis.nl zone was still a pre-signed DNSSEC zone. While reading the PowerDNS documentation I found out that PowerDNS is able to do “Front-signing”, which is an amazing feature. PowerDNS does the signing part on-the-fly. There is no need to re-sign the zone every time you make a change to the zone. First of all I changed the filename in /etc/powerdns/bindbackend.conf to the unsigned one. After that I created a database to manage the DNSSEC keys, added a line to the PowerDNS configuration to use this database and restarted PowerDNS. I liked to keep the KSK and ZSKs I was already using for my zone, so I imported those. That’s it. I’m really happy PowerDNS integrated DNSSEC in it’s product instead of having an additional toolset to manage DNSSEC pre-signed zones. On January 19th, 20:39:59 UTC, it got completely out of hand. 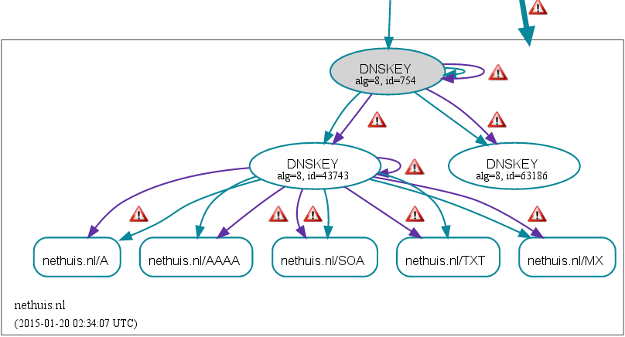 The images below from dnsviz.net showed me the nethuis.nl zone was expired on all the Authoritative DNS slaves. It was clear that the slaves didn’t transfer the zone after it was re-signed by the Authoritative DNS master. According to RFC 1996 the SOA record should be increased if you want the Authoritative DNS slaves to update their zones. This is something that was clearly not done in my case. I found the SOA-EDIT setting. My current SERIAL is configured in the YYYYMMDDSS format, so I configured the SOA-EDIT setting to use INCEPTION-INCREMENT. This overrules the SERIAL that is configured in the on-disk zone-file. Every Thursday after the zone is re-signed the SERIAL is automatically increased and all Authoritative DNS slaves will transfer the new zone. This entry was posted in Know How on January 1, 2015 by pommi. But there is also a lot of development on the Linux front. There is Flashcache developed by Facebook, dm-cache by VISA and bcache by Kent Overstreet. The last one is interesting, because it’s a patch on top of the Linux kernel and will hopefully be accepted upstream some day. In my low power homeserver I use a 2TB Western Digital Green disk (5400 RPM). To give bcache a try I bought a 60GB Intel 330 SSD. Some facts about these data-carriers. The 2TB WD can do about 110 MB/s of sequential reads/writes. This traditional HDD does about 100 random operations per second. The 60GB Intel 330 can sequentially read about 500 MB/s and write about 450 MB/s. Random reads are done in about 42.000 operations per second, random writes in about 52.000. The SSD is much faster! The image below shows the idea of SSD caching. Frequently accessed data is cached on the SSD to gain better read performance. 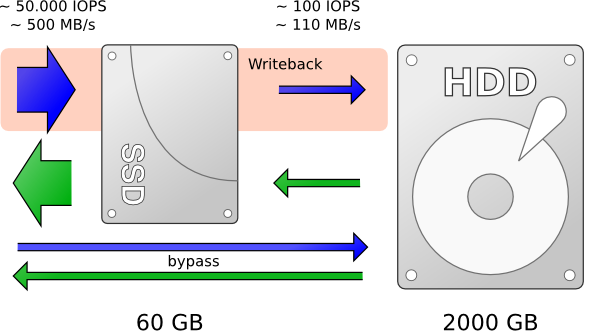 Writes can be cached on the SSD using the writeback mechanism. I used the latest available 3.2 kernel. The bcache-3.2 branch from Kent’s git repo merged successfully. 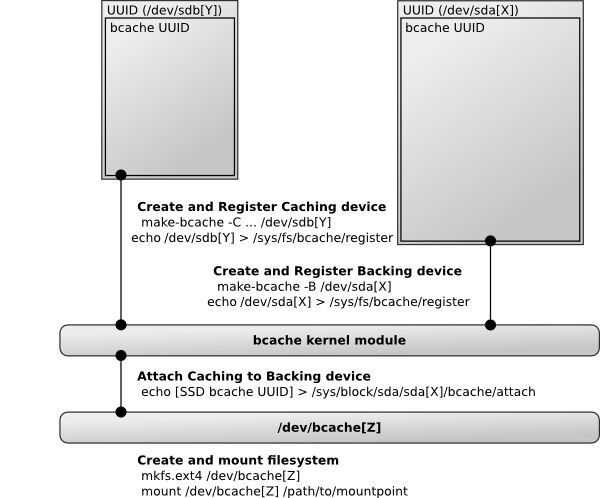 Don’t forget to enable the BCACHE module before compiling. On my low power home server I use Debian. Since there is no bcache-tools Debian package available yet, I created my own. Fortunately damoxc already packaged bcache-tools for Ubuntu once. Unfortunately bcache isn’t plug-and-play. You can’t use bcache with an existing formatted partition. First you have to create a caching device (SSD) and a backing device (HDD) on top of two existing devices. Those devices can be attached to each other to create a /dev/bcache0 device. This device can be formatted with your favourite filesystem. The creation of a caching and backing device is necessary because it’s a software implementation. Bcache needs to know what is going on. For example when booting, bcache needs to know what devices to attach to each other. The commands for this procedure are shown in the image below. After this I had a working SSD caching setup. Frequently used data is stored on the SSD. Accessing and reading frequently used files is much faster now. By default bcache uses writethrough caching, which means that only reads are cached. Writes are being written directly to the backing device (HDD). To speed up the writes you have to enable writeback caching. But you have to take in mind, there is a risk of losing data when using a writeback cache. For example when there is a power failure or when the SSD dies. Bcache uses a fairly simple journalling mechanism on the caching device. In case of a power failure bcache will try to recover the data. But there is a chance you will end up with corruption. To detach the caching device from the backing device run the command below (/dev/bcache0 will still be available). This can take a while when the write cache contains dirty data, because it must be written to the backing device first. To benchmark this setup I used two different tools. Bonnie++ and fio – Flexible IO tester. Unfortunately Bonnie++ isn’t that well suited to test SSD caching setups. This graph shows that I’m hitting the limit on sequential input and output in the HDD-only and SSD-only tests. The bcache test doesn’t show much difference to the HDD-only test in this case. Bonnie++ isn’t able to warm up the cache and all sequential writes are bypassing the write cache. In the File metadata tests the performance improves when using bcache. The Flexible IO tester is much better to benchmark these situations. For these tests I used the ssd-test example jobfile and modified the size parameter to 8G. In these tests the SSD is much faster with random operations. With the use of bcache random operations are done a lot faster in comparison to the HDD-only tests. It’s interesting that I’m not able to hit the sequential IO limits of the HDD and SSD in these tests. I think this is because my CPU (Intel G620) isn’t powerful enough for these tests. fio hits the IO limits of the SSD in an another machine with a Intel i5 processor. This entry was posted in Know How on December 7, 2012 by pommi. An interesting thing happened last week when I upgraded qemu-kvm from version 0.12.5 (Debian Squeeze) to 1.1.2 (Debian Wheezy). After a reboot (shutdown and start) of all my VM’s, they are using less CPU in total! I noticed this from the stats Collectd is collecting for me. I’m running about 5 Debian Linux VM’s on my low power home server (Intel G620, 8G DDR3, DH67CF). Most of the time the VM’s are idle. As you can see in the graph below the CPU usage dropped. 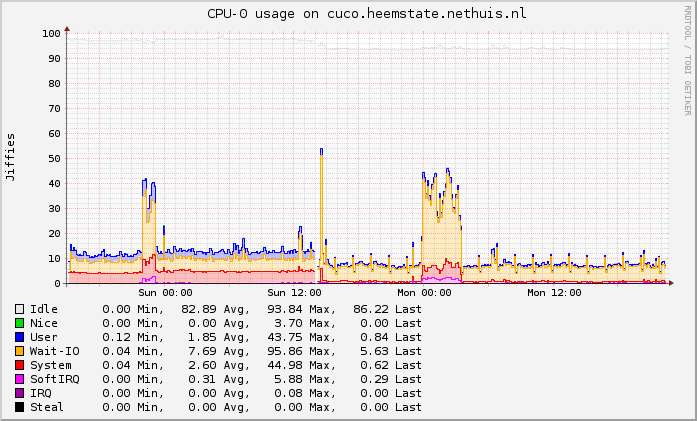 In particular the System CPU usage. The Wait-IO usage is mostly from Collectd, saving all the stats. Looking a bit further I also noticed that the Local Timer Interrupts and Rescheduling Interrupts are halved. They’ve done a nice job at Qemu-KVM! This entry was posted in Know How on October 27, 2012 by pommi. Since a while I’ve been monitoring the power consumption of devices in my home using a power meter from BespaarBazaar.nl (advised by Remi). This power meter is a good one because it is very precise. It starts measuring at 0.2 Watt. I needed an Ethernet switch to connect my TV, NMT and PS3 to my home network. While searching for a proper switch, I came across DLinkGreen.com. It looked promising. The Green Calculator, a 8.7MB Flash app which is using a lot of CPU (hello D-Link! is this Green?!? what about HTML5? ), showed me I could save 70,98% of energy (2h, 1-5 ports > 28.7Wh D-Link Green vs. 99Wh Conventional per day) using D-Links Green technology. I couldn’t find any green switches from other manufacturers so gave it a try. I bought a D-Link DGS-1005D. It’s a 5-ports unmanaged Gigabit Ehternet switch, supporting IEEE802.3az (Energy Efficient Ethernet), IEEE802.3x (Flow Control), 9000 bytes Jumbo Frames and IEEE802.1p QoS (4 queues). So I did some tests using the power meter. As reference I used a HP Procurve 408 (8 ports 100Mbit switch). First of all it’s interesting to see that the power adapter from HP is using 1.4 watts on it’s own already. Besides that it’s nice to know that a 100Mbit port uses less energy than a Gigabit port. The Green Calculator is quiet right in my case. I’m saving about 72~74% of energy. This entry was posted in Know How on April 17, 2012 by pommi. The disk is preformatted FAT32. After mounting the disk, df shows me there is actually 976283280 KiB (932GiB) available. This is about 999714078720 bytes. It looks like 490807296 bytes (468MiB) is gone, but it must be used for File Allocation Tables. Because FAT32 is crappy old and I use Linux and want a journaling filesystem, I will reformat the device with ext3. After setting the right partition table type via fdisk. After a minute or 10 (yeah! USB 2.0) it was all done. First of all 2646016 bytes (2584 KiB) is not formatted (1000204886016 – (244190000 * 4096)). After mounting the disk, df shows me this time there is 961432072 KiB (917 GiB) available. This is less then FAT32, but we have a journaling filesystem now. 15327928 (97676000 – 961432072) KiB is used for that. But why and how? /dev/sda1 has 7453 block groups. Inode size is 256 bytes. 8192 inodes for each block group. 7453 * 256 * 8192 makes 15630073856 bytes (15263744 KiB) for inode space. Besides one primary superblock, 18 extra backup superblocks are stored on the disk. A superblock is 256 bytes, though it is stored in a 4 KiB block. 19 * 4096 makes 77824 bytes (76 KiB). If someone has an explanation for it, please leave a reply. 61054976 inodes means there can be stored over 61 million files on the formatted 917 GiB. This is way too much for me. 10% of it is enough too, so there will also be less space needed for storing the inodes. Formatting the disk with option -i 131072 sould better fit me. This entry was posted in Know How on December 30, 2008 by pommi.